Fuzz, echo, reverb, big bass, they're all out! The new guitar sound is funky, and you'll get that with the wide range funk box. Just crank potentiometer R7 (range) and you'll get an extra twang from way down low to way up high. Adjustment is easy, simply vary potentiometer R4 (trimmer) until you hear a whistle (oscillation); then back off R4 until the oscillation just ceases. Attention! 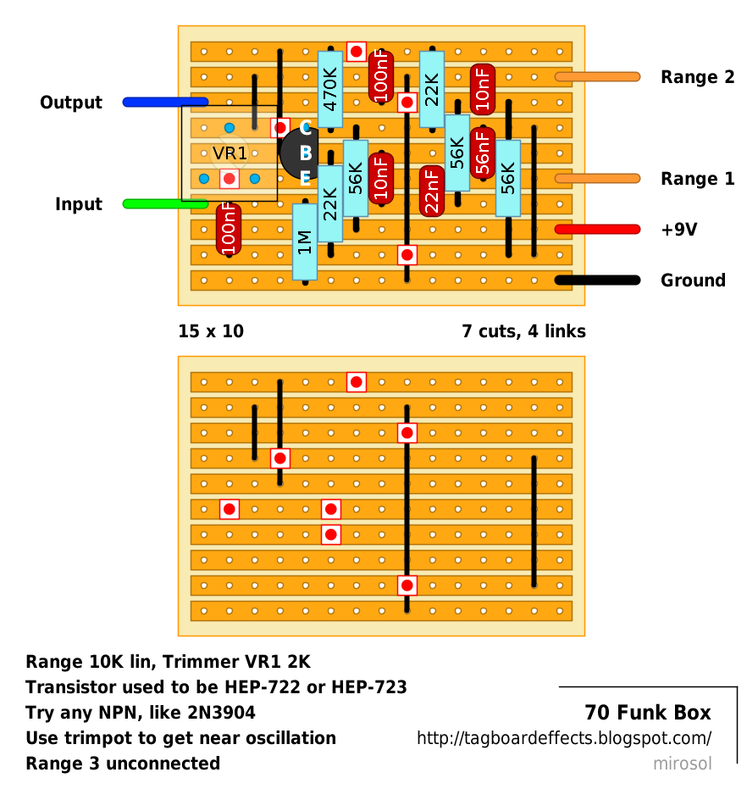 Madferret verified this and he noted that it is a reasonable wah with range pot acting as a wah pot. And you shouldn't use your girlfried as a knob turner in the long run. Also. It may be a good idea to wire a 10K lin pot external instead of the trimmer. I am really in need for a BD2 BOss Blues Driver. How about this layout? has anyone done it? It also has a few mods. I have the schematic if anyone needs. Yes, there are some things that are just unsuited to both mine and Miro's way of putting these layouts together. Avoiding standing components would make our layouts for the BD2 quite a bit larger than Harald's and with a lot more links, and so I personally don't think we could add much value to what is already available. Personally when it gets to something like this that would result in a layout too large for a 1590B when there isn't an excessive number of pots or other reason for it to be housed in a larger box, then I would prefer to use a PCB. I can´t wait for someone to build this and let us know what the hell it really does. If I had the parts around I´d do it myself. Really wanne know if I should include it in my next batch (which thanks to the sh*tload of new layouts here, especially the runoffgroove ones, is already insanely big). what is this? an autowah? Ok, I've just built this and as far as I can tell the circuit is correct but it's not really giving a strong modulation, it's almost like it's right on the verge of happening. 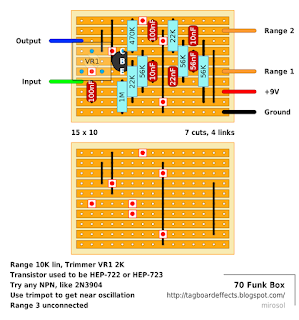 If I'm right in thinking this is the circuit you've based it on: http://www.epanorama.net/schematic.php?file=schematicsforfree/Audio/Musical/Circuits/Guitar%20Funk%20Box%20-%20Use%202N4401.pdf then it's possible that either the trim pot needs to be 5k or a different transistor with a bit more gain is needed to tip it over the edge. So far moving the 10k pot changes the frequency of the bandpass filter and gives a wah effect but from what I can gather it's meant to provide a kind of auto wah too. No luck with changing the transistors, if anything a higher hfe produces a really crappy distortion. I'm using a 2k5 trim pot and with it cranked and the guitar's volume rolled back it's clean and seems to be just on the verge of modulation. I think a trip to Maplin is in order tomorrow to pick up a 5k trim pot and then get the multimeter out to find a low gain 3904 from my stash. ..and there are not many build reports going around regarding this circuit either. Didn't find any..
"Fuzz, echo, reverb, big bass, they're all out! The new guitar sound is funky, and you'll get that with the wide range funk box." Now here's something interesting... using the NTE cross reference, the HEP722 cross-references to the NTE108. Here's a datasheet for the NTE108. If you can find anything close to that, you're in business... maybe a particularly low gain 2N2222? NTE cross-reference is infamous (or so i've read) because it is pointing more to the general electronics. You have any 2N3903s or 2N2369s? Yeah, NTE's pretty bad. The 2N3904, 2N2222A, and I believe the 2N5088 all cross-reference to the same part (I believe it's the NTE123). NTE stuff is all my local electronics shop stocks, so I'm stuck with it when I need to buy little things... at a cost of $1.50 a transistor! So I've probed the transistor legs and they're all way off the values that PRR stated (0.66v @ C, 0.57v @ B and 0v @ E). This is where my basic electronic theory knowledge lets me down though, I checked the voltages with a few different settings on the trim pot and they got better the lower it was set (0.97v@C, 0.88v@B and 0.32v@E) but still not what they should be, I figured it'd be worth checking the resistance of the trim pot, the maximum setting reads 2.2kohm which is within tolerance but at the minimum setting and it's reading 1.5kohm! I've not had much call to use many trim pots but this doesn't sound right to me. Is it possible I'm getting the problem s because I can't set the pot low enough? What does the trimmer read if you remove the transistor? That's only connected to ground and emitter, so it could the transistor that gives you the wrong reading. You could also try bigger value for the trimmer. I'm getting 2.17k across the trimmer without the transistor, I think I'll pick up a couple of trimmers tomorrow and try them out. I've not really got any to hand. Either way I'm pretty sure the layout's good, I'd definitely sub a standard pot for the trimmer though as moving between single coil and humbuckers means you have to tweak it, also you'd be able to save a column. *WARNING: Long term use of your girlfriend in place of a wah enclosure may result in damage to your person and/or guitar. Thanks! I'll tag it and maybe add a notion that it would be better in a wah enclosure. Cheers, I forgot to mention that you only get the 'whistle' that the original article mentions if you leave the guitar unplugged. OK, now this wah works great! Just add a 10uF capacitor between the 22k resistorS- HERE -100nF capS. Enjoy! At last!! Made some additional mods... So the 10uF cap is still a good idea (see previous post). You can put a 250k pot (in serie with a few k resistor) instead of the 220k resitor between input and output for a slight dry/wet control. A simple buffer/adjustable gain stage at the output is a nice addition. It eliminates the oscillation problem that will occur if you switch from high to low input instrument (and also make the previously suggested mod of replacing th 10k trimpot with an external pot unecessary). It also reduce the gain attenuation contrast when you bypass the whole thing. I tried this circuit with a 50k photoresistor instead of the 10k wah pot and it prove to be an excellent candidate to become a light controlled wah pedal. "...high to low [impedance] input instrument..."